Now a vampire, Koyomi is charged with retrieving Kiss-shot's severed limbs from the vampire hunters who took them. Before he confronts the first hunter, the gigantic full-vampire Dramaturgy, he has a conversation with Tsubasa. He hides his vampire nature, but Tsubasa is still interested in the rumors about vampires being spread around. At the fight, Dramaturgy tears Koyomi's arms off in one blow, but Koyomi discovers his vampire power of rapid regeneration. 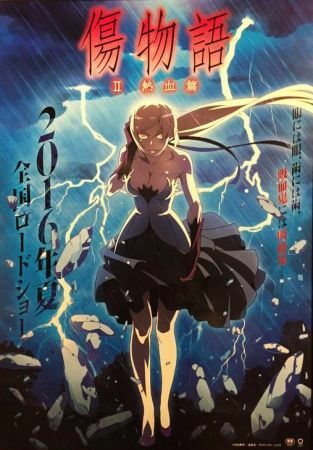 Seeing the fight as lost, Dramaturgy surrenders Kiss-shot's leg to Koyomi. At the time, Kiss-shot has taken the form of a child. But she morphs into a young teenager after she consumes her adult leg. Read more on Wikipedia.